​​​​​​​​ HARLINGEN – The City of Harlingen posted a 12.2 percent year-over-year gain in sales tax reimbursement for September 2017. In August 2017, Harlingen posted an 8.83 percent increase year-over-year. 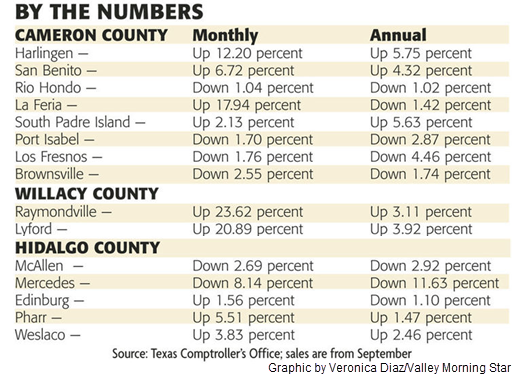 Elsewhere in Cameron County, San Benito was up 6.72 percent; La Feria was up 17.94 percent;​ and ​South Padre Island was up 2.13 percent. Statewide, Texas had an unusually strong month, with $774.9 million being sent back to cities and towns, a five percent increase over last year.